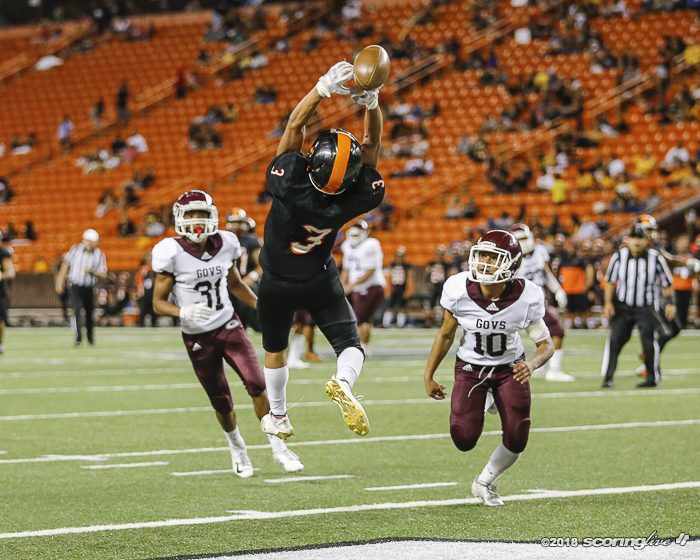 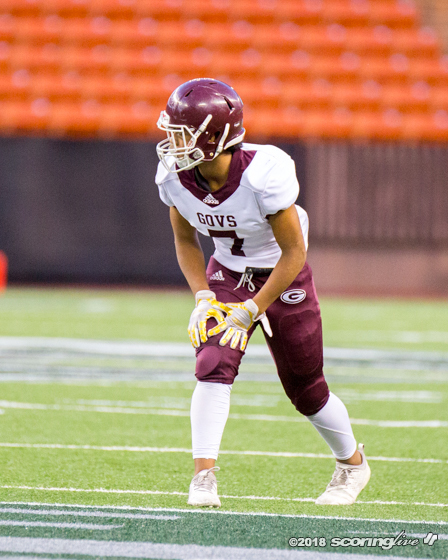 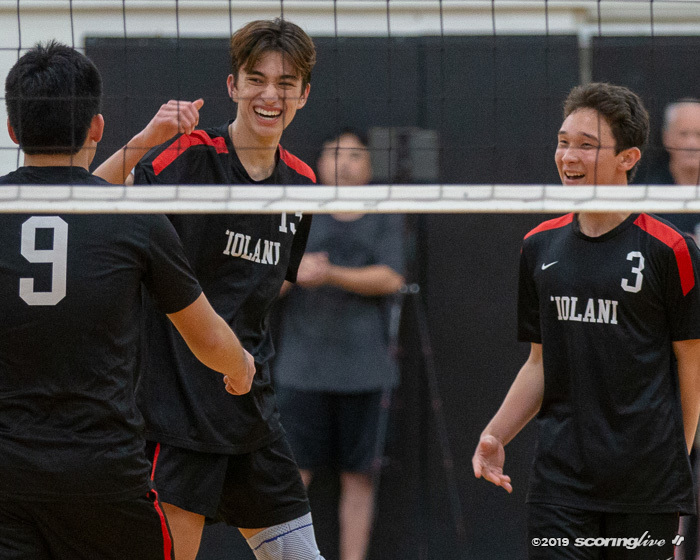 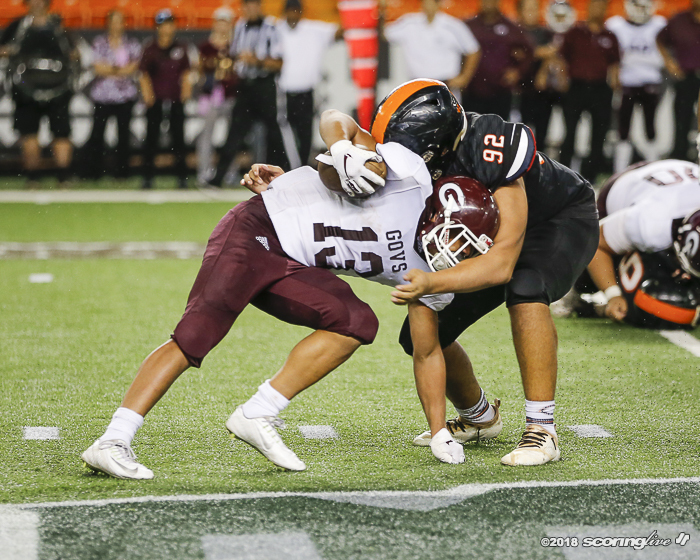 HALAWA — Less than a week after playing in a junior varsity game, freshman Blaine Hipa stepped up with a four-touchdown performance to help No. 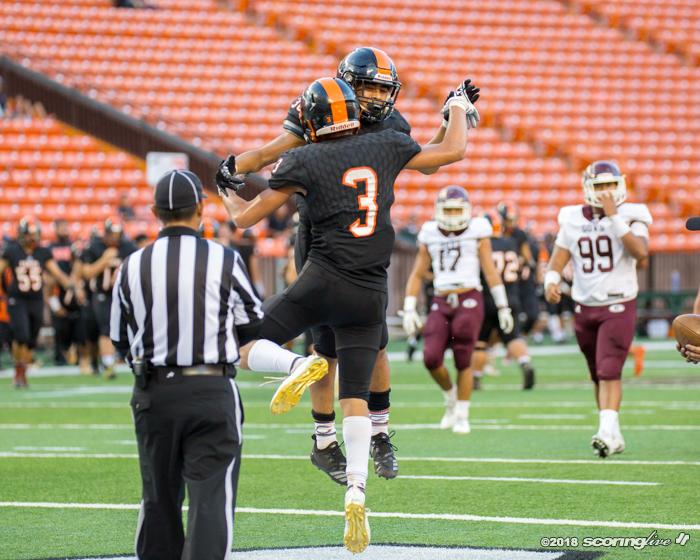 5 Campbell advance to the Open Division Football State Championships. 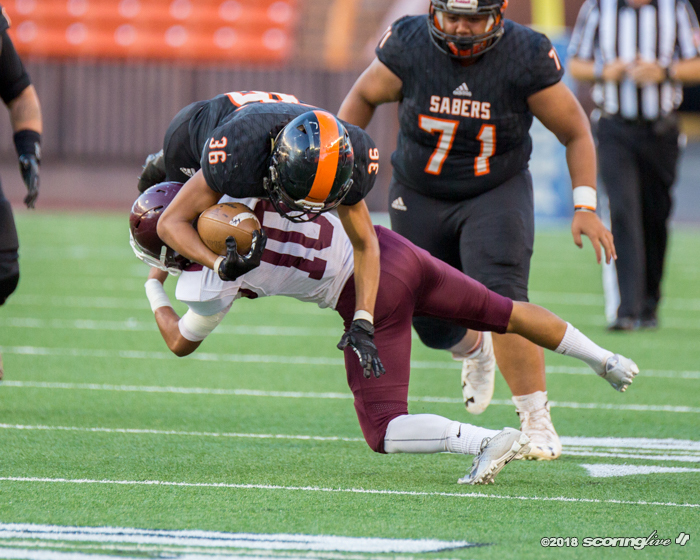 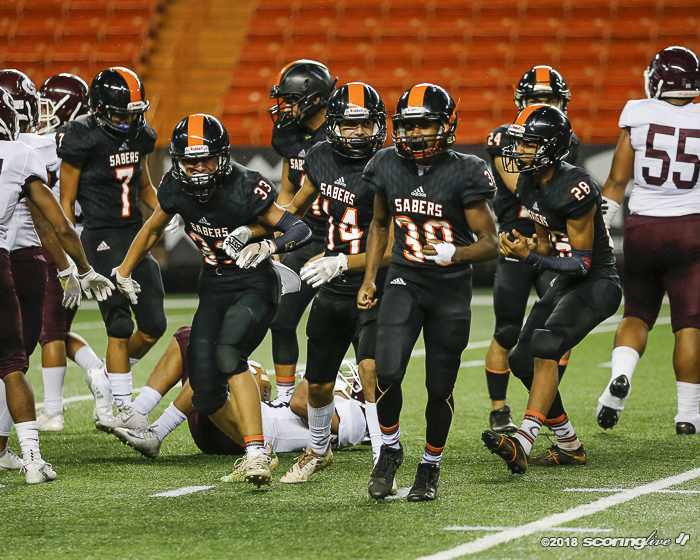 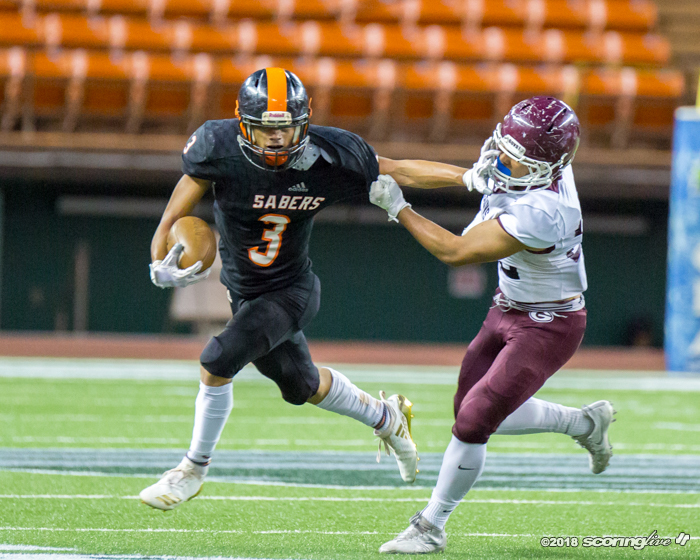 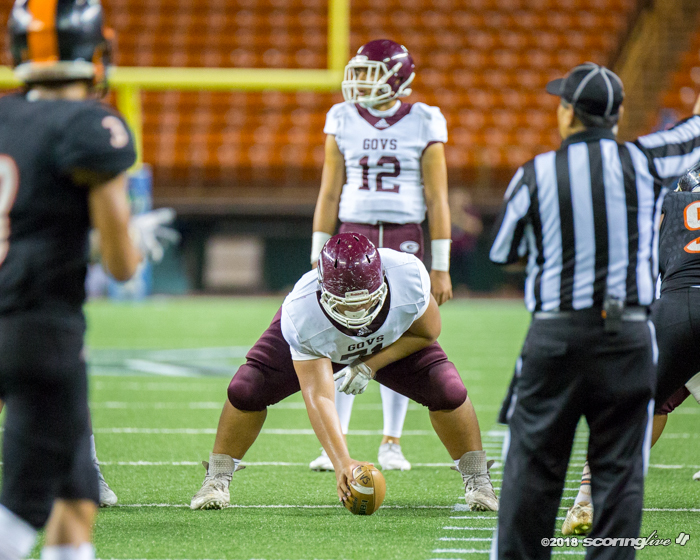 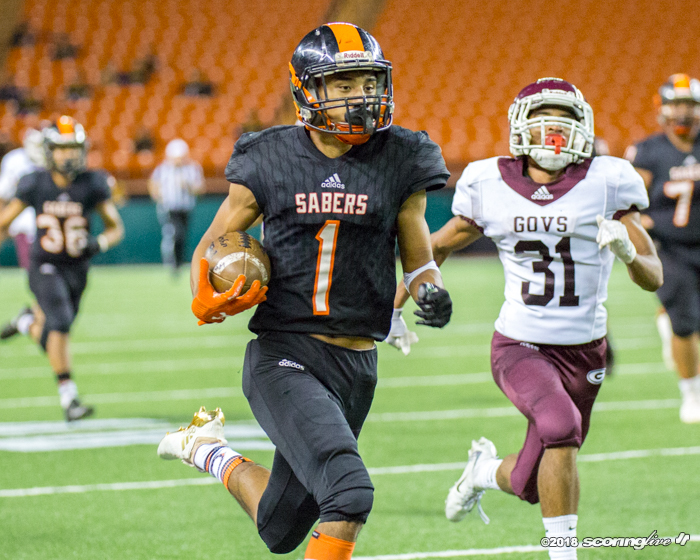 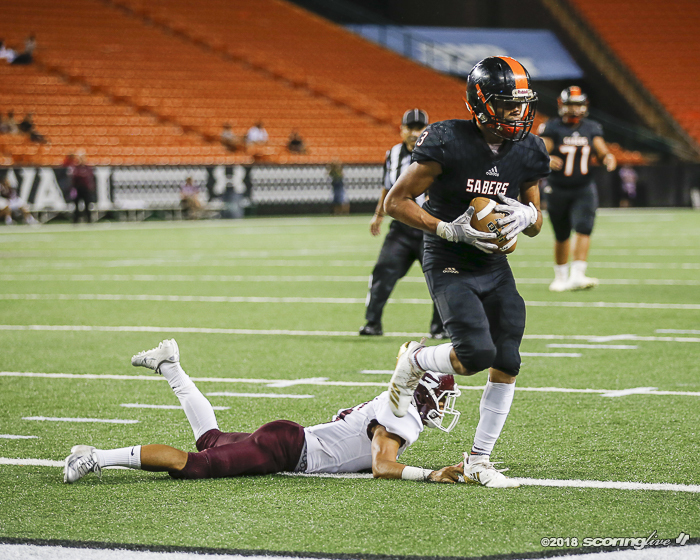 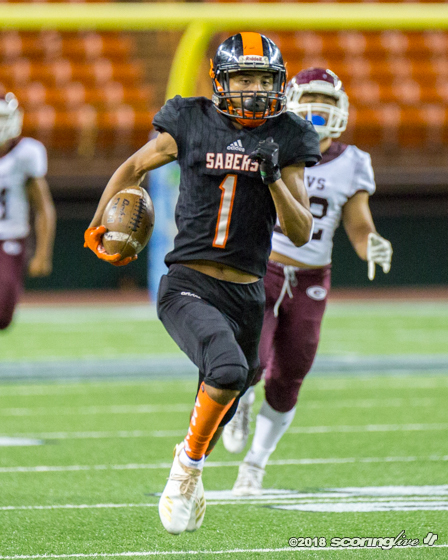 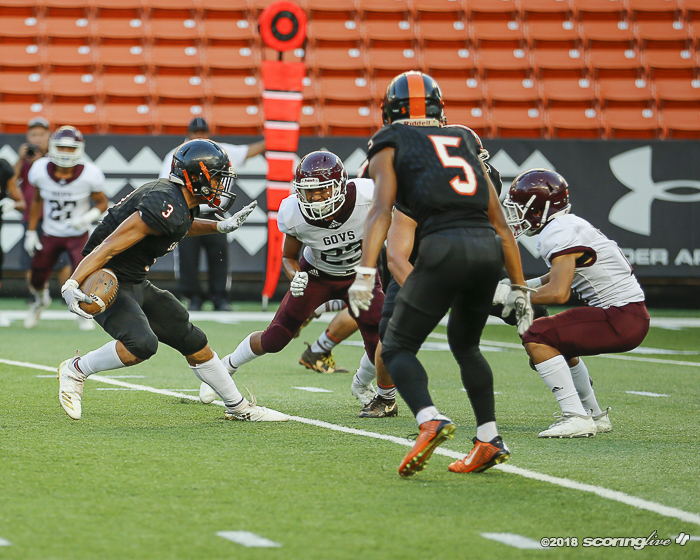 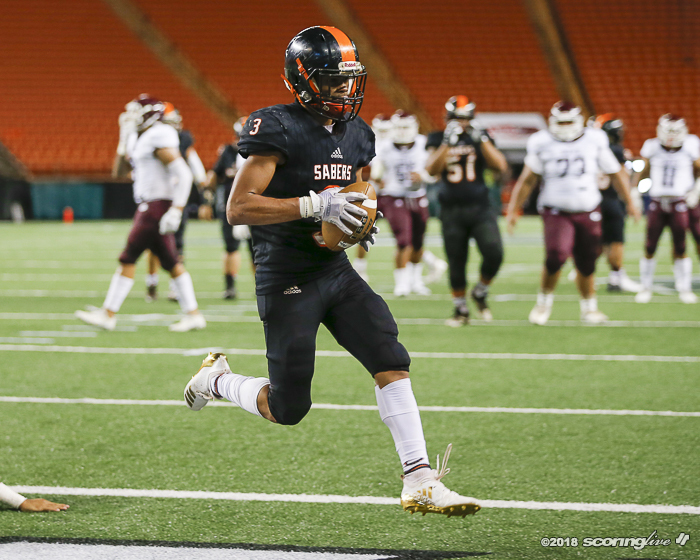 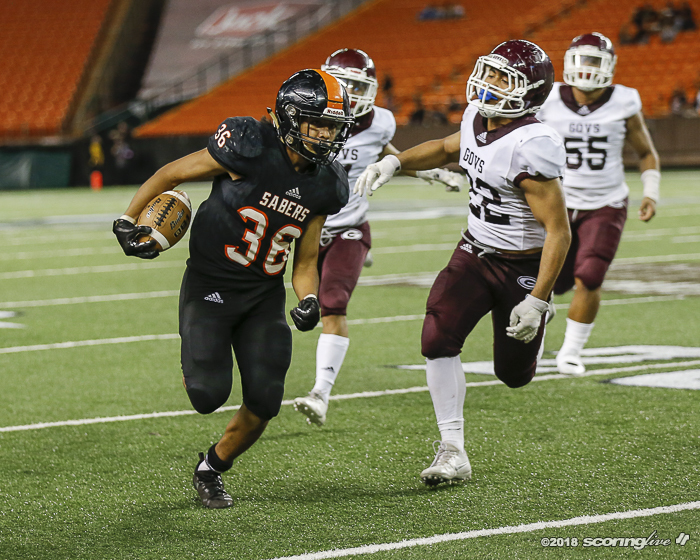 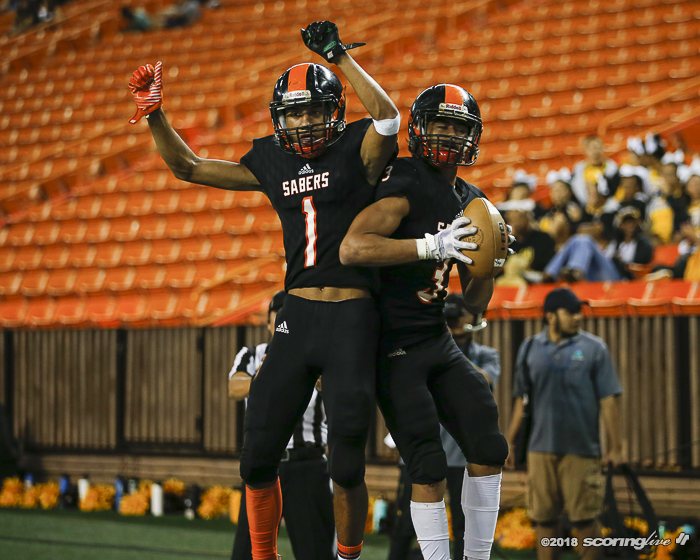 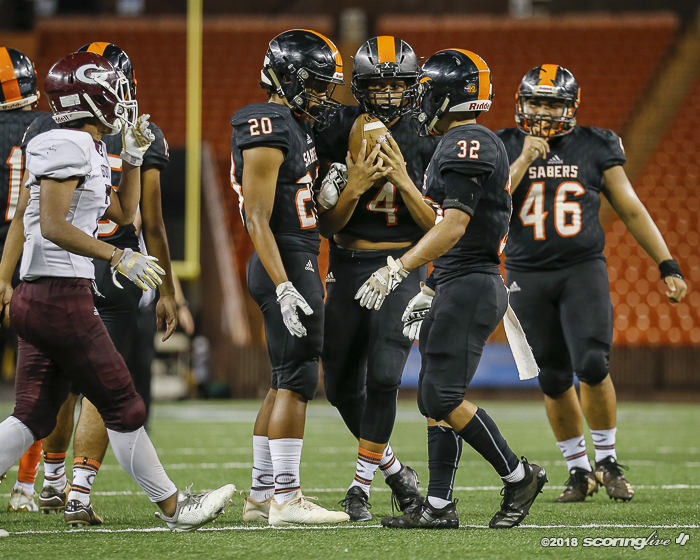 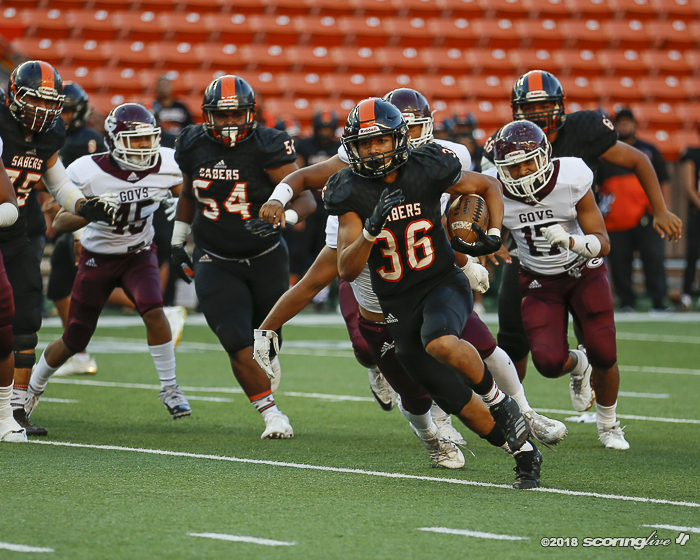 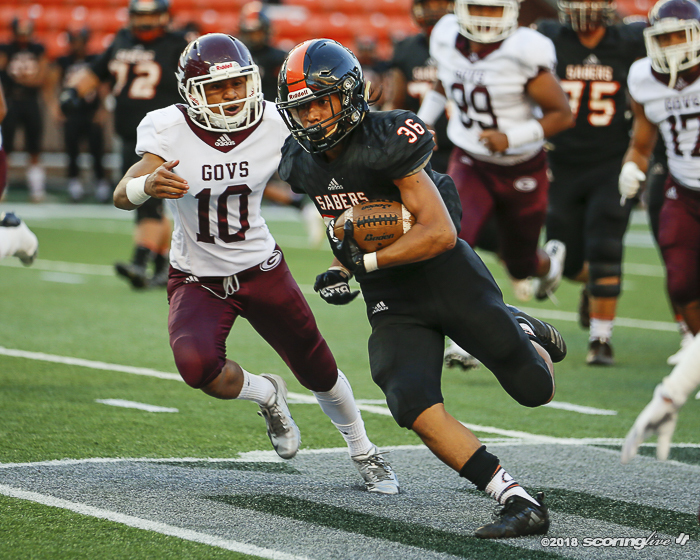 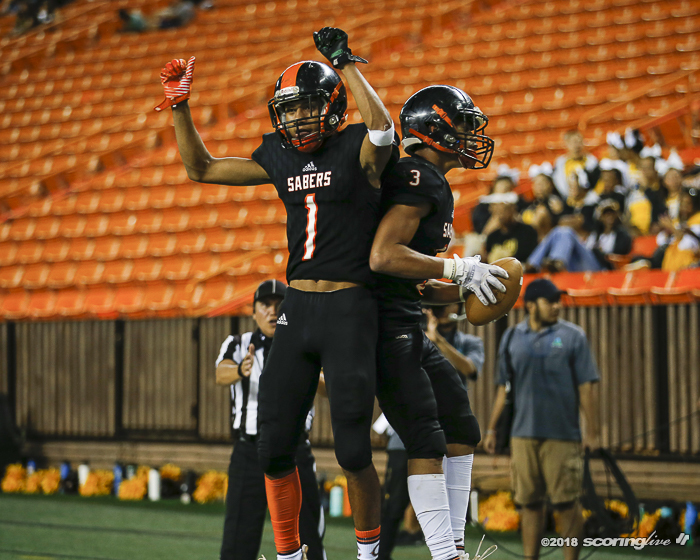 On the strength of 11-of-21 passing for 241 yards, Hipa led the Sabers to a 42-26 win against Farrington for third place in the Oahu Interscholastic Association Open and the final state berth Friday night at Hawaiian Financial Field at Aloha Stadium. 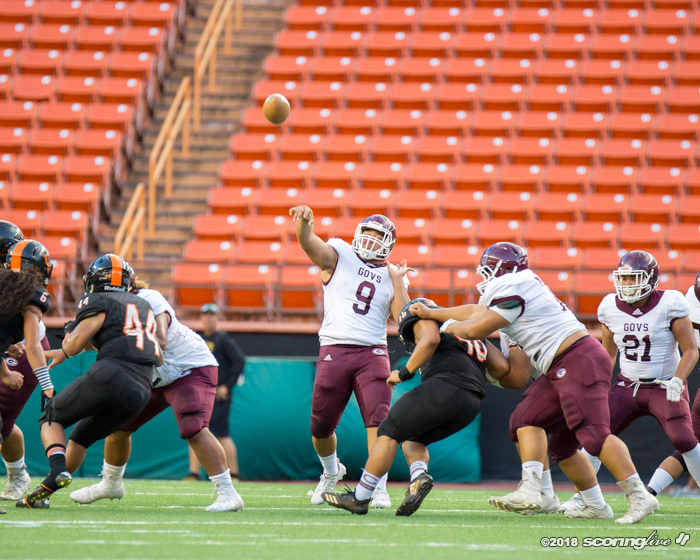 Hipa got the start for usual starter Krenston Kaipo, who is nursing a shoulder injury. 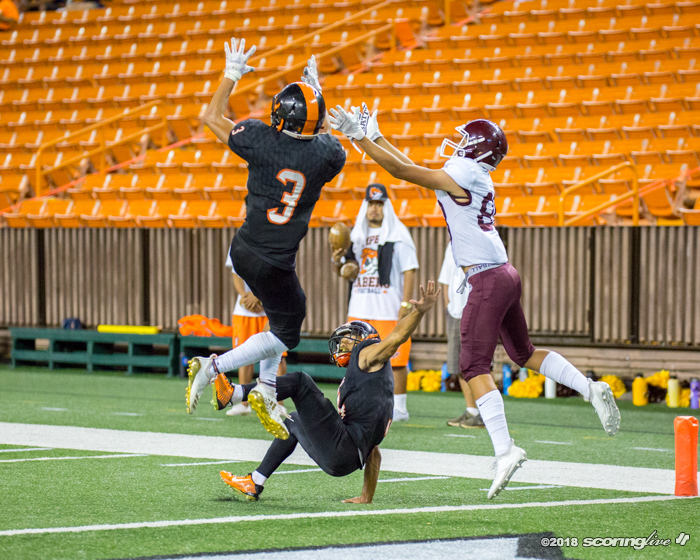 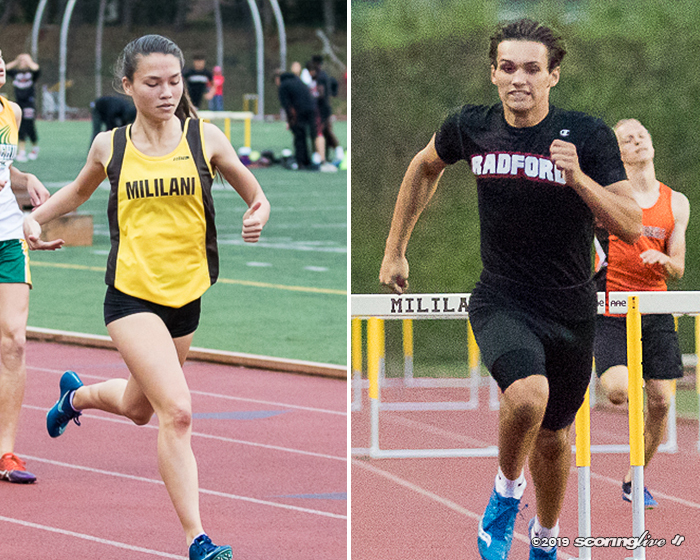 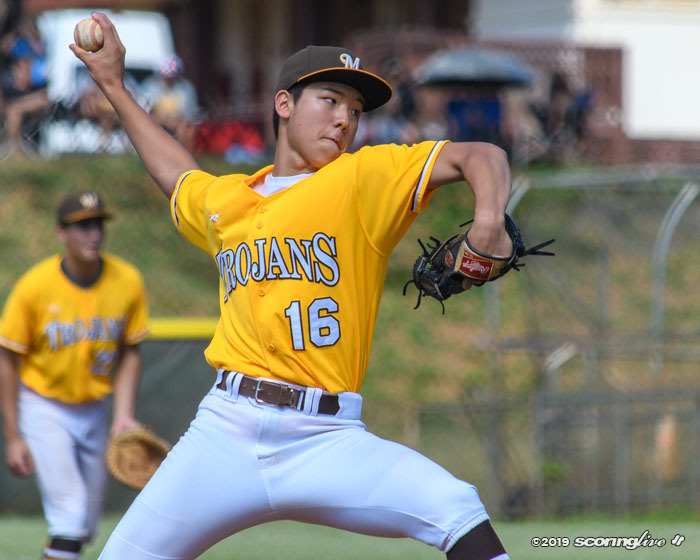 Last Saturday, Hipa played in an OIA Open JV semifinal in a loss to Mililani. 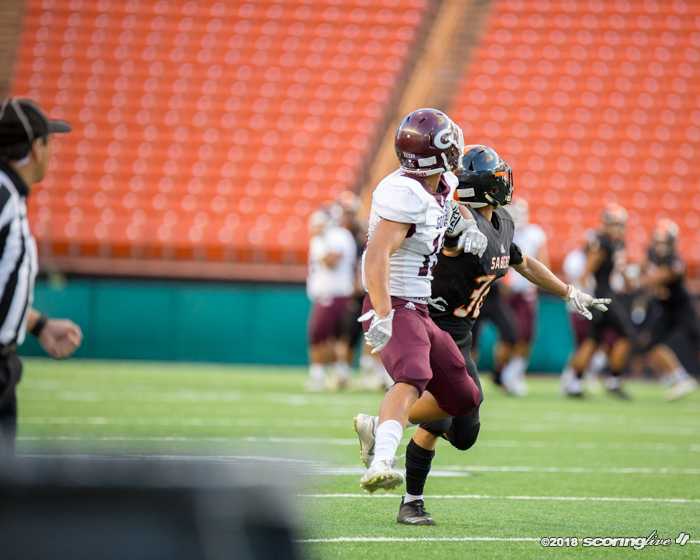 Friday night, he was taking snaps for the varsity. 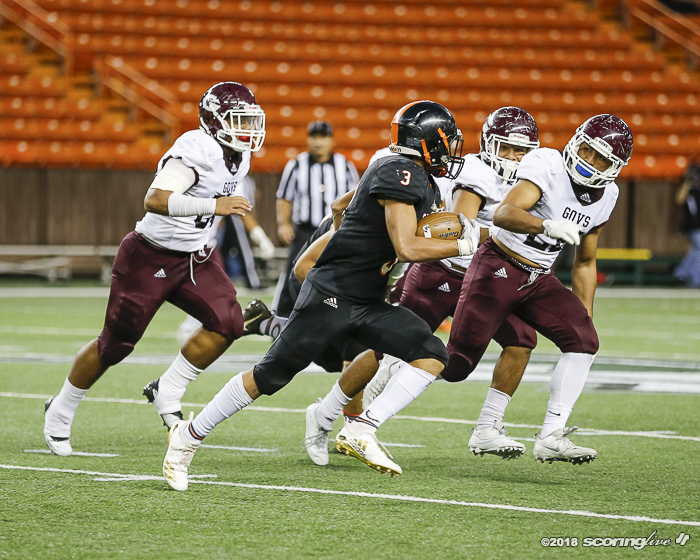 "The speed of the game," Hipa said the difference from JV and varsity. 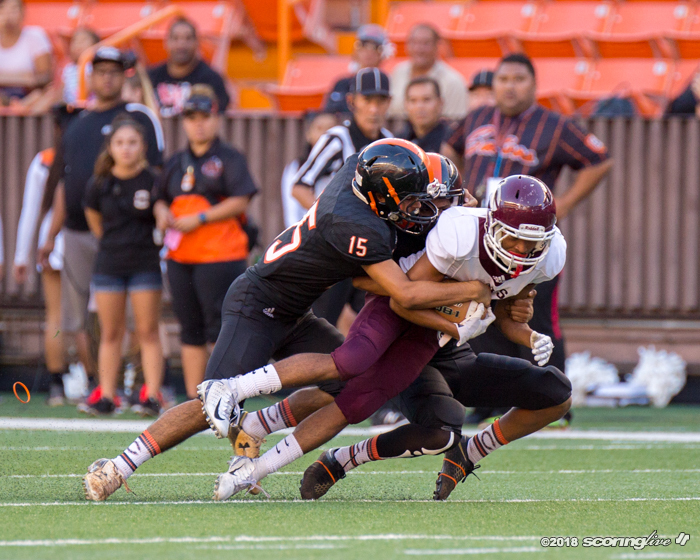 "Everything is a lot quicker. 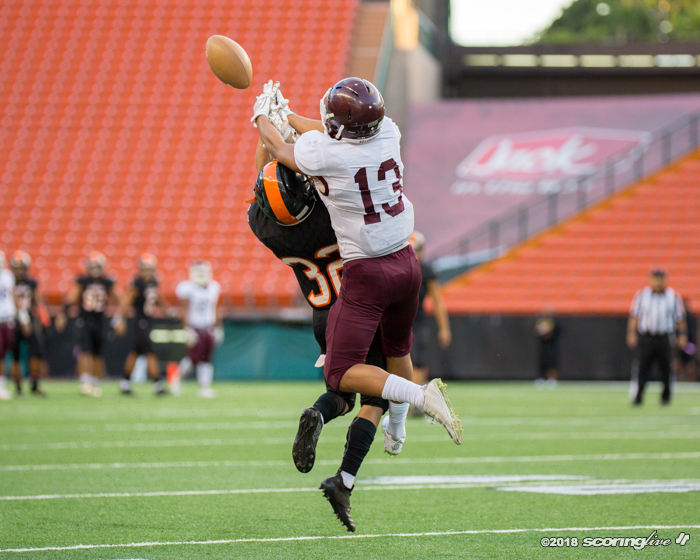 Everyone's more skilled and the techniques are way better than the younger level." 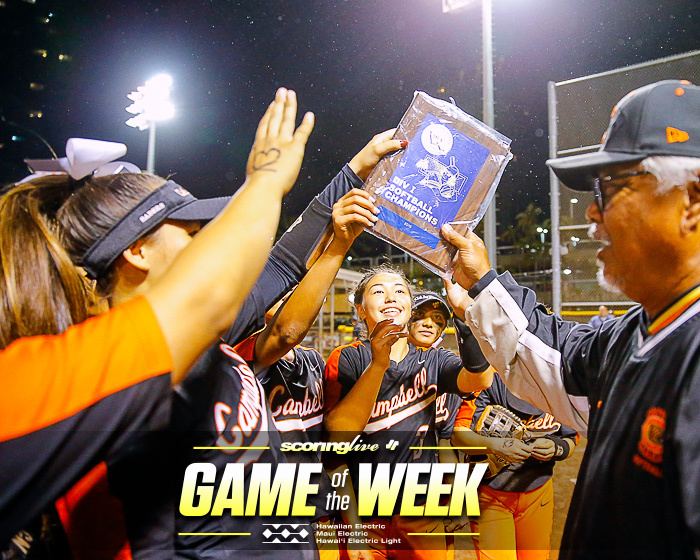 Campbell coach Darren Johnson said he told Hipa midweek he would be starting. 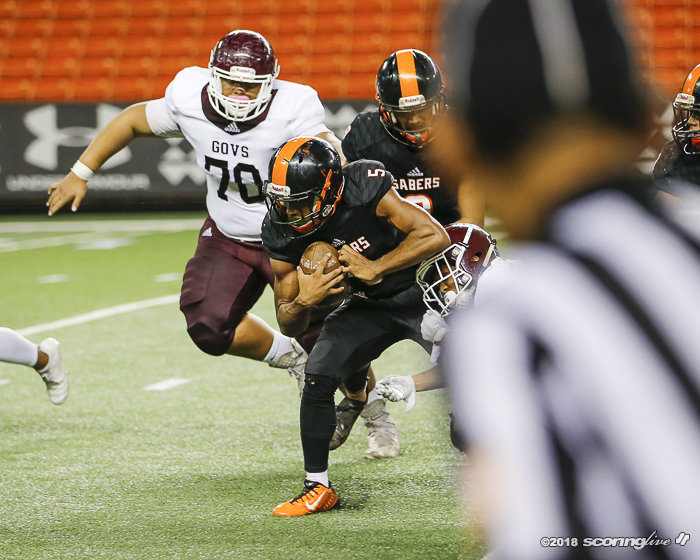 "We're happy with him," Johnson said of his 6-foot, 170-pound QB. 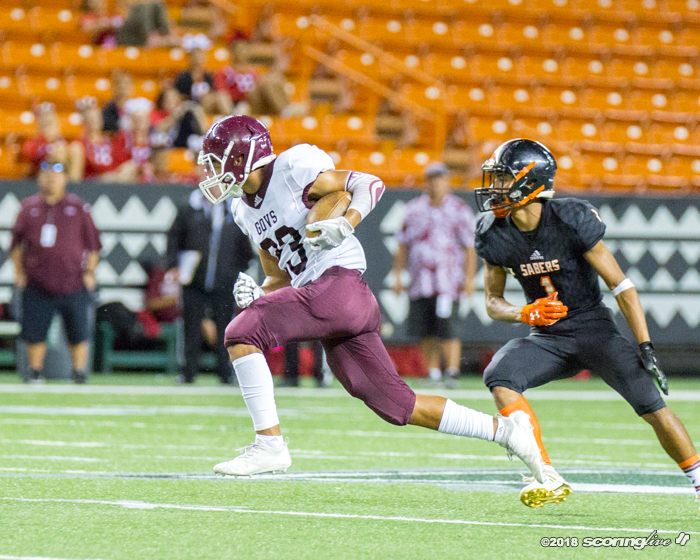 "We were hoping to rest him the whole second half but we needed something on offense to try to get off the gas pedal." 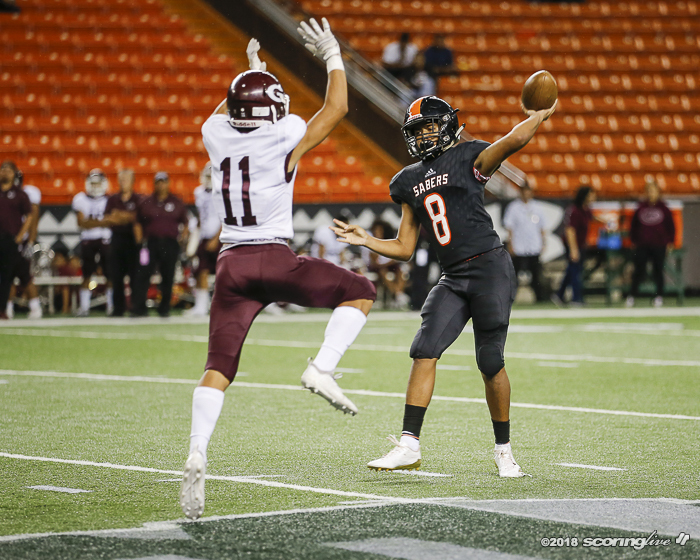 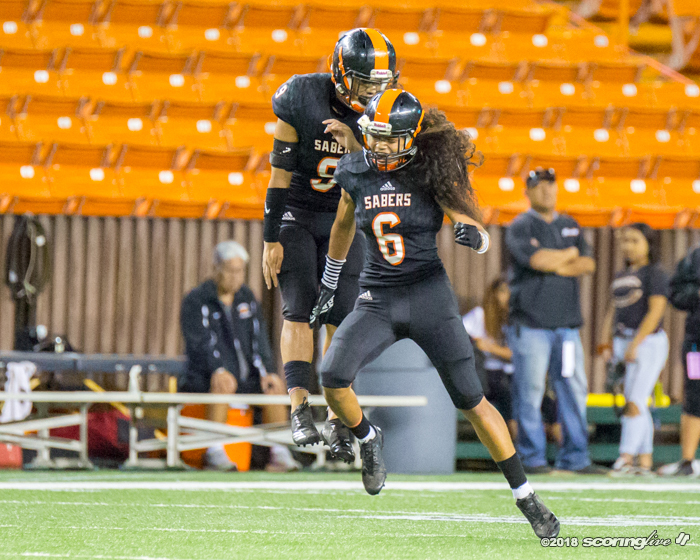 Hipa threw TD passes of 15 and 16 yards to Pokii Adkins-Kupuaa and 76 and 11 yards to Titus Mokiao-Atimalala. 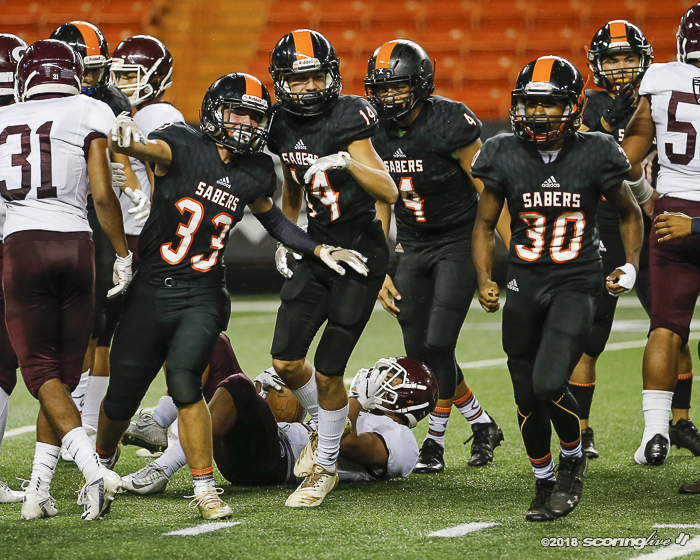 The Sabers (8-4) return to the state tournament for the first time since 2016, when they lost in the semifinals of the Division I tournament. 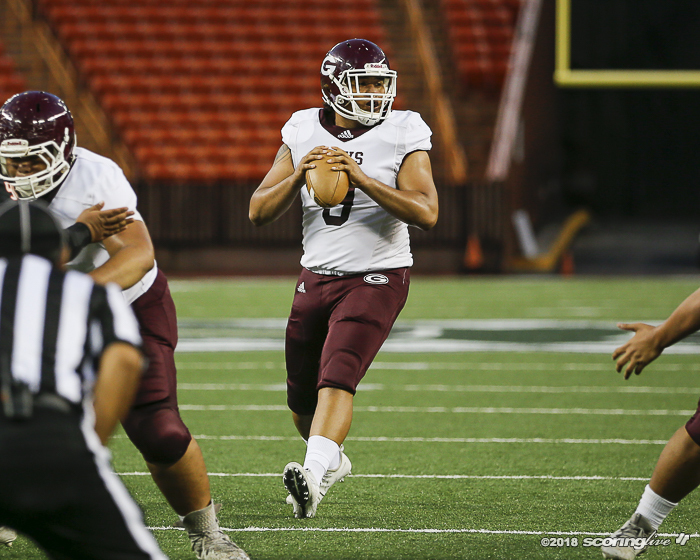 Farrington ends its season at 2-10, its first losing season since 2005 (5-7), when it lost in the OIA third-place game. 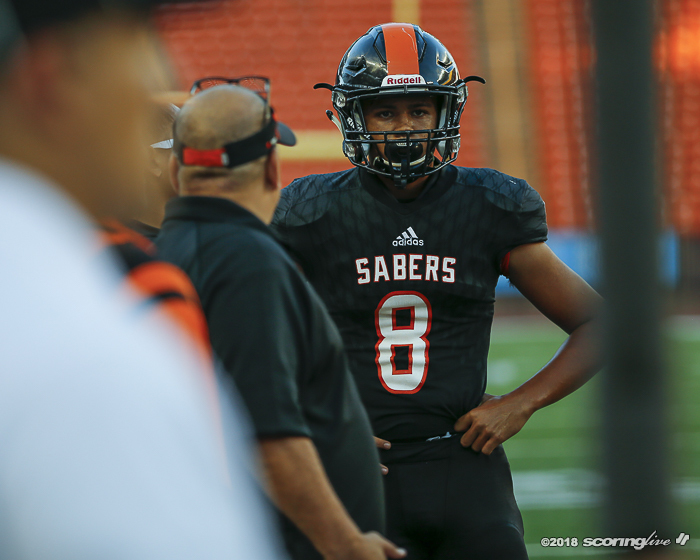 So who is going to start in the state opener on Nov. 16? 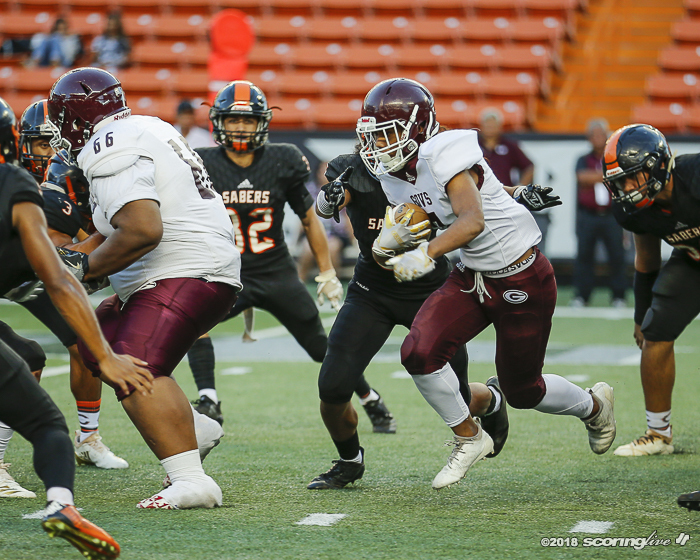 "Whoever Kawe (Johnson) says," Johnson said of his offensive coordinator son. 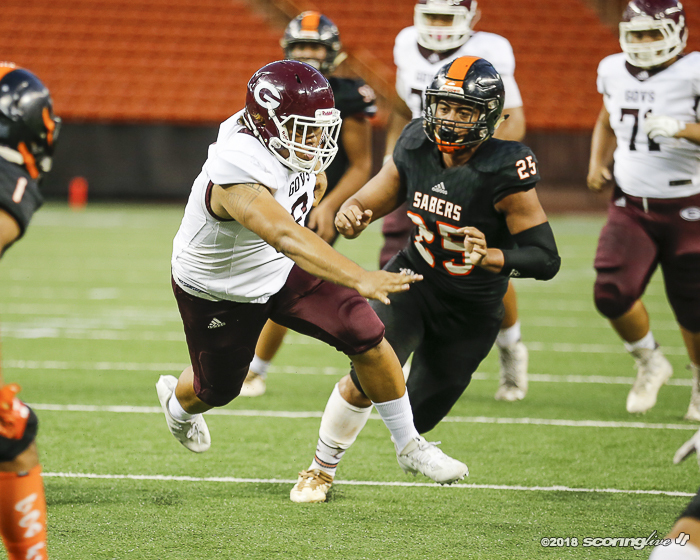 "(Kaipo) could play," Johnson said. 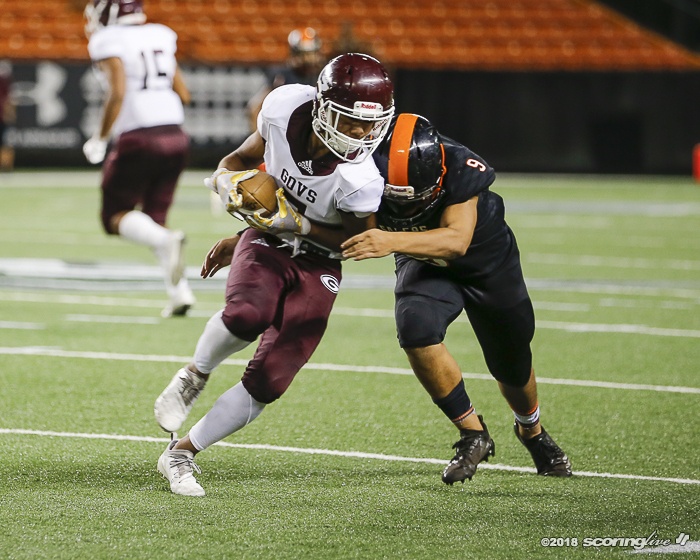 "We have two weeks now (to get ready). 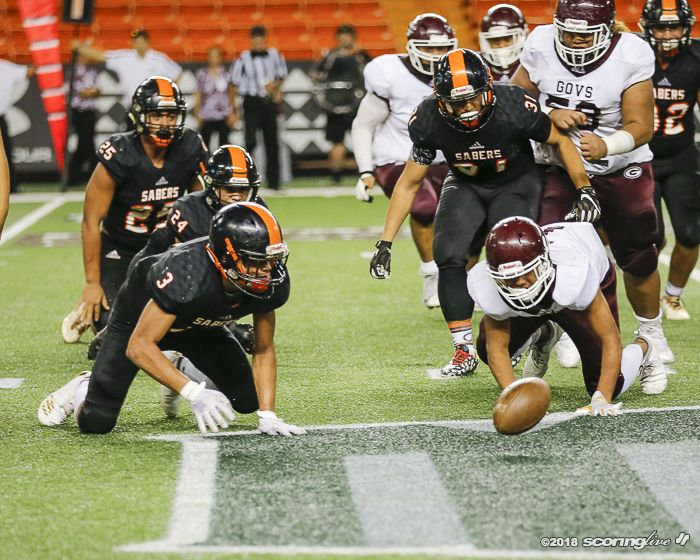 Hopefully, we can come out of the state tournament and play a good game." 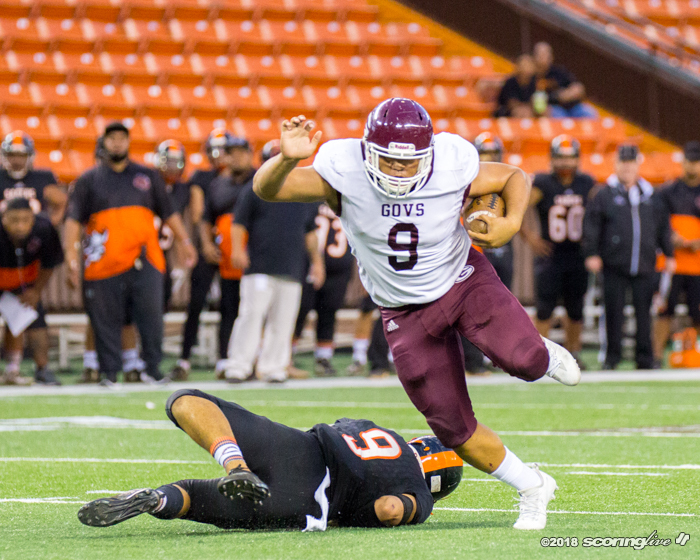 Kaipo did take a few snaps against Farrington because "(Hipa) forgot the play," Johnson said. 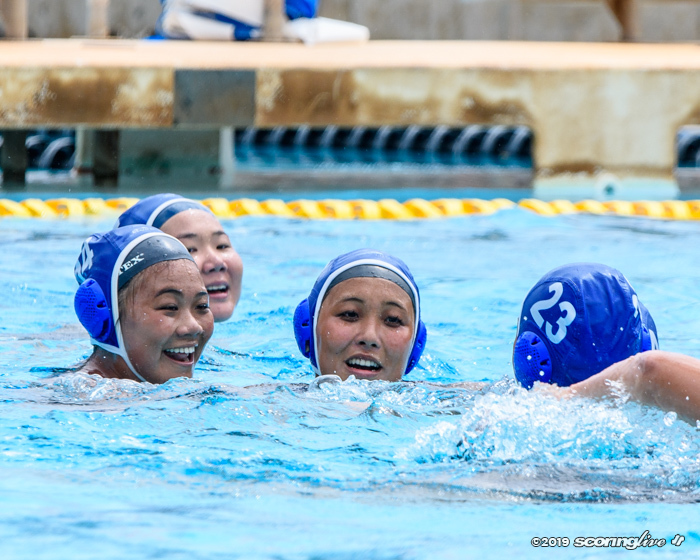 Still, there was little to be critical about Hipa. 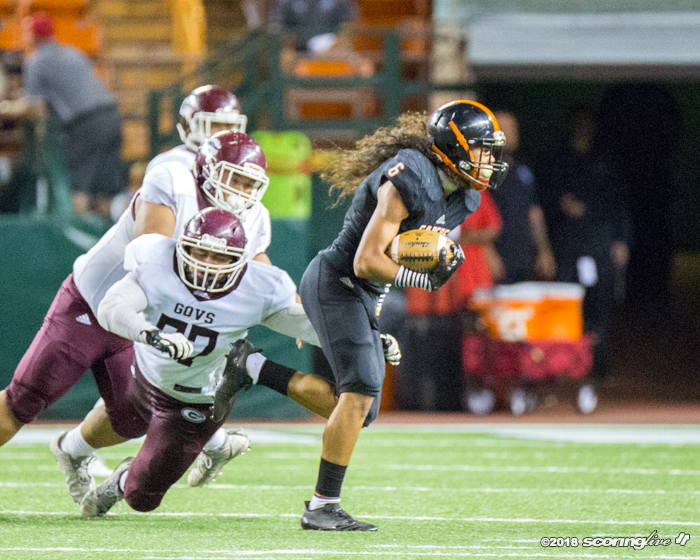 "He looked good out there," Campbell senior offensive tackle Sir Wallace Chanel said of Hipa. 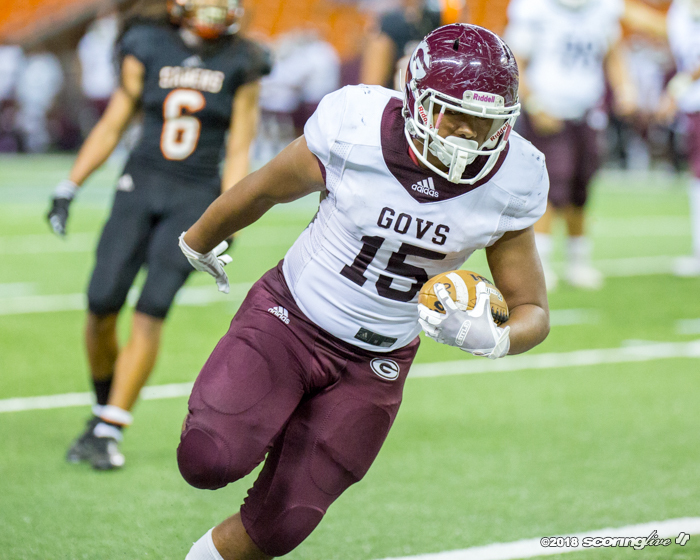 "He's young, but he's developing as a good, young man. 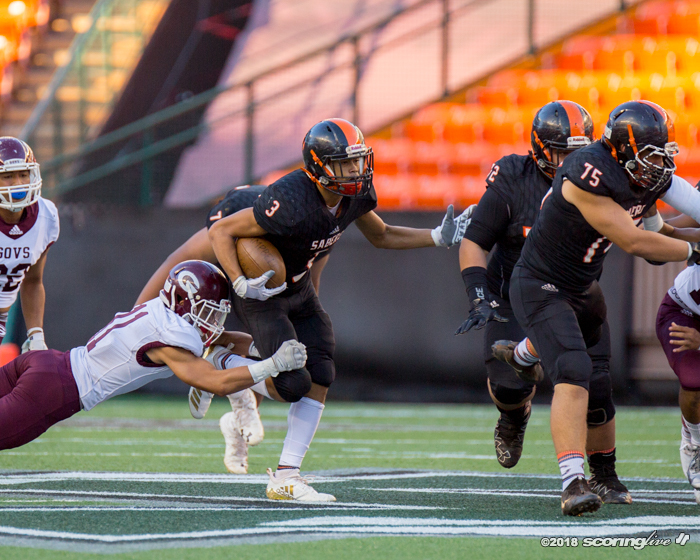 We just had to give him time. 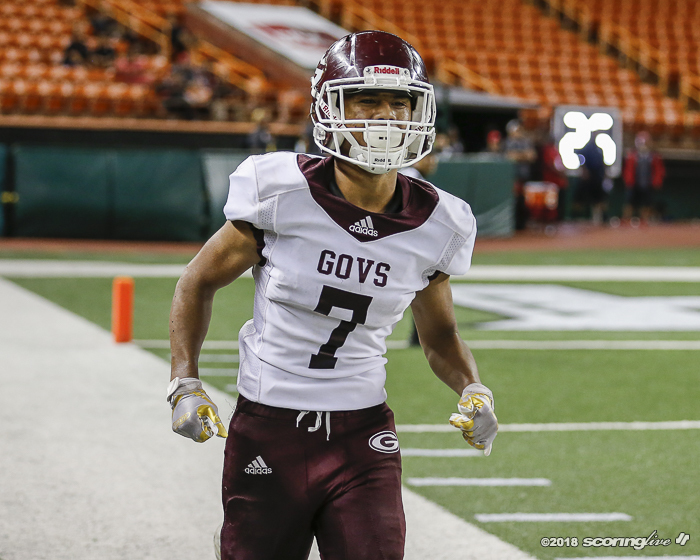 When we gave him time, he took the right reads and knew what he was doing." 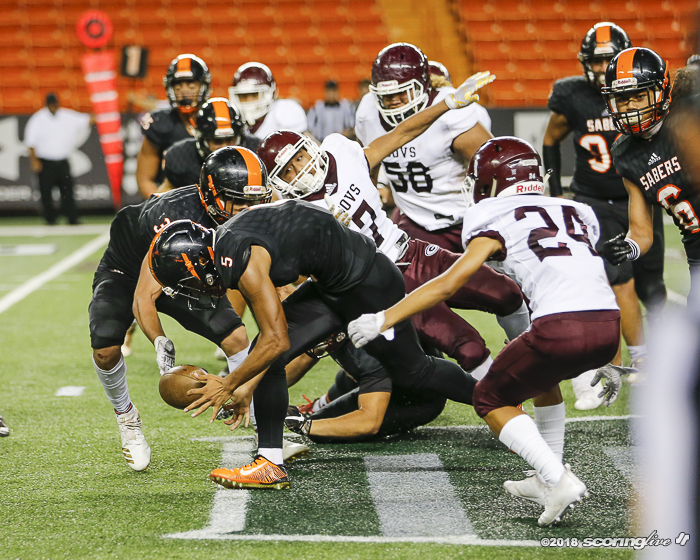 The score was not indicative of the 16-point margin. 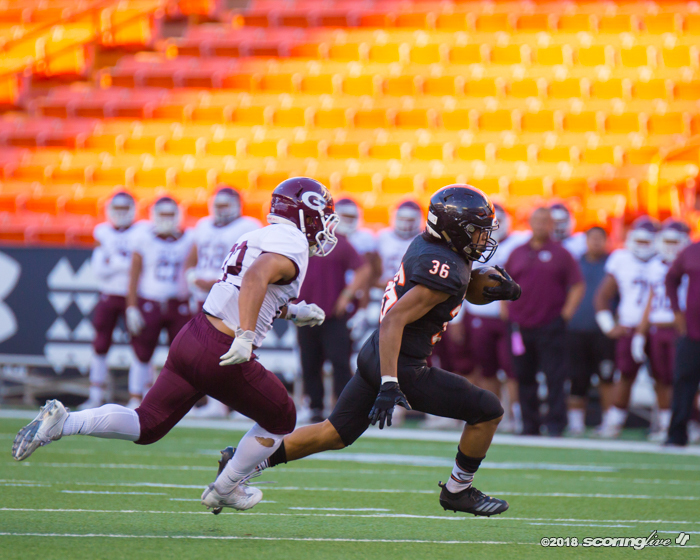 Campbell had control of the contest. 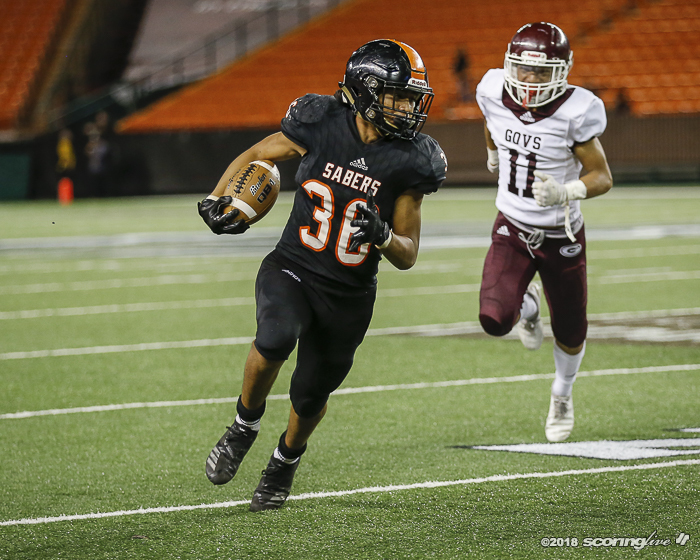 The Sabers took the opening kickoff and needed just five plays to travel 62 yards before running back Sky Lactaoen scored on a 17-yard run. 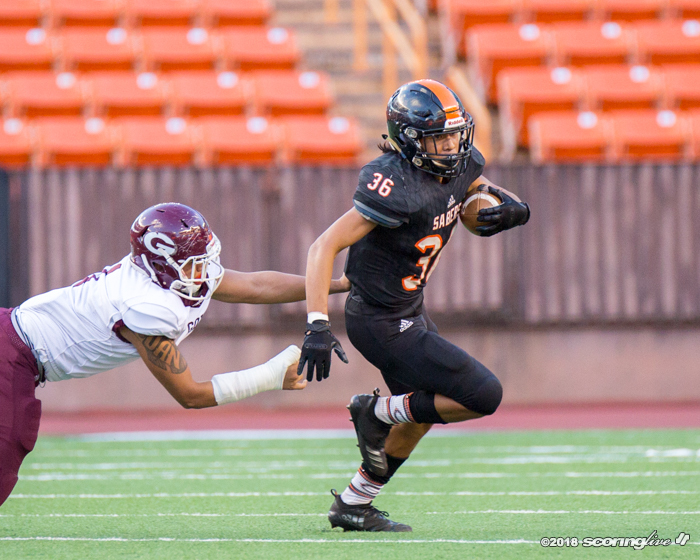 Jadon Arola's PAT gave Campbell a 7-0 lead one minute, 49 seconds into the game. 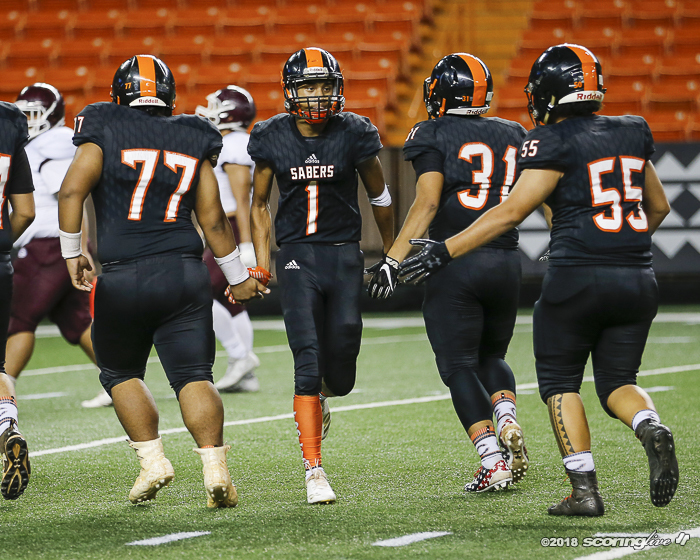 Campbell scored on its next series on an eight-play, 80-yard drive that ended with Hipa hitting Adkins-Kupukaa from 15 yards to make it 14-0 with five minutes left in the first period. 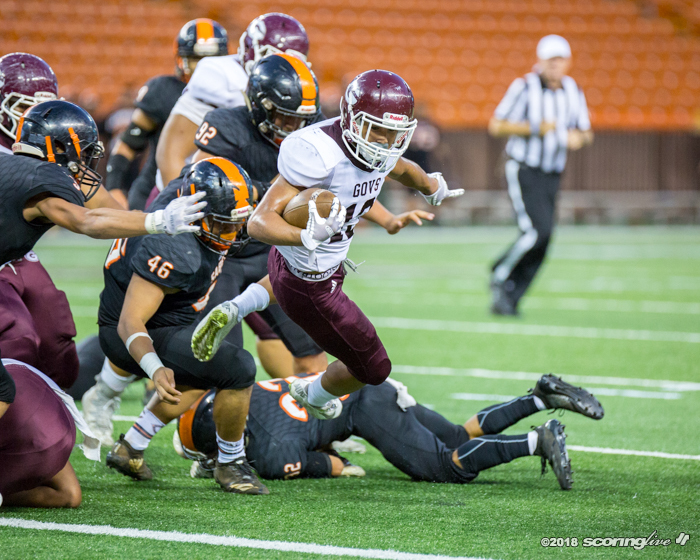 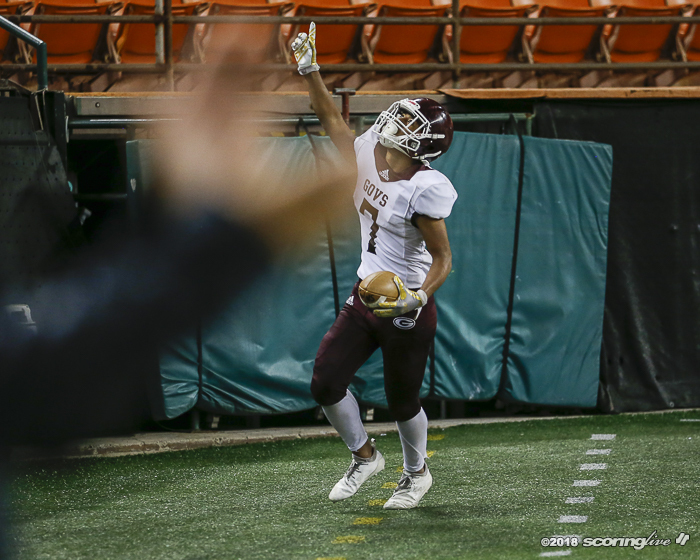 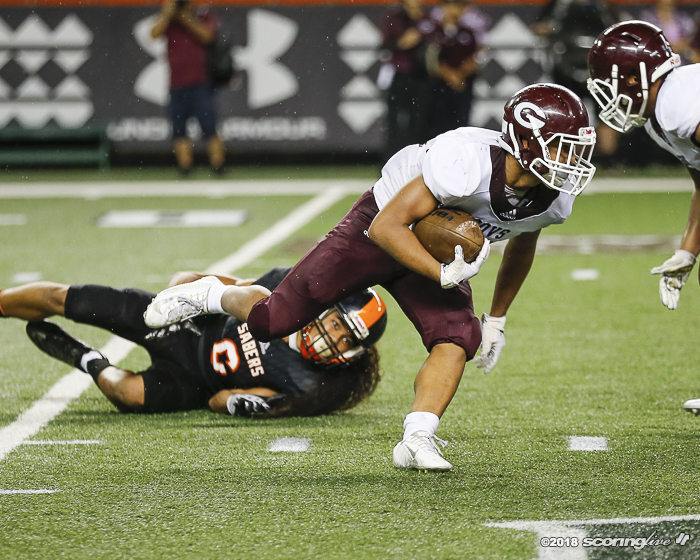 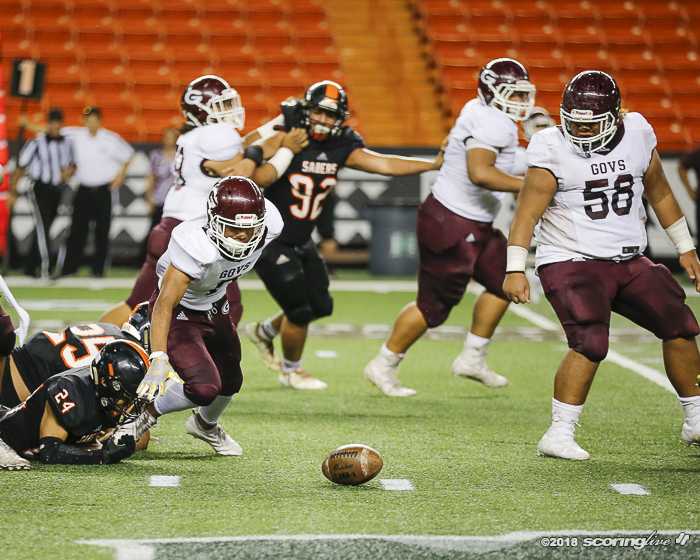 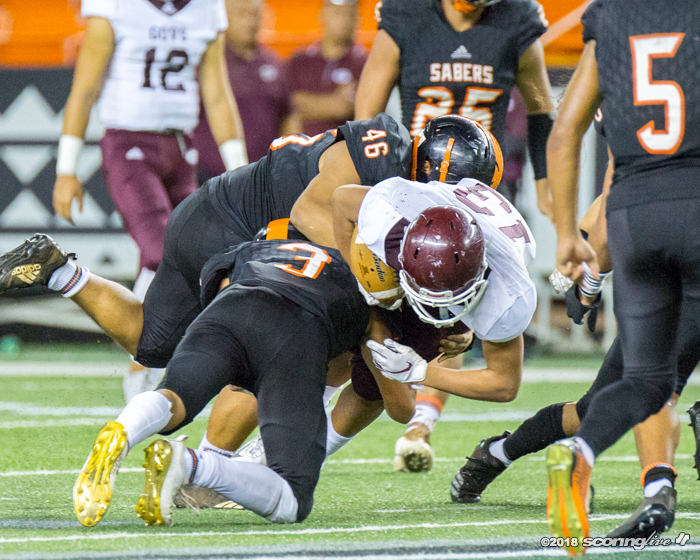 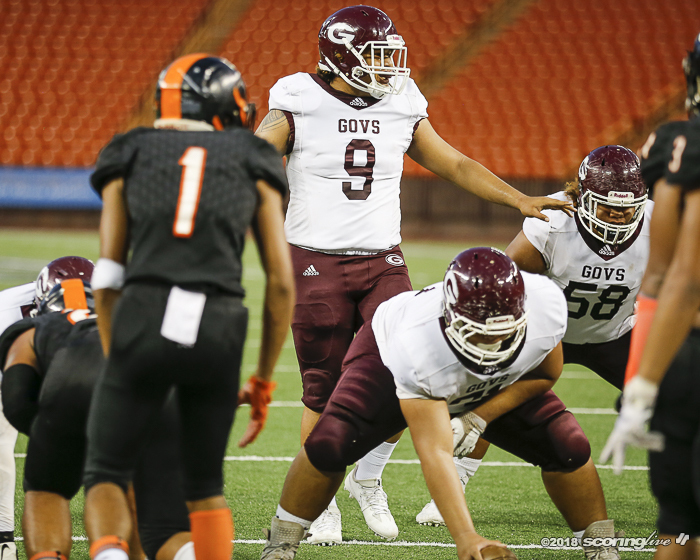 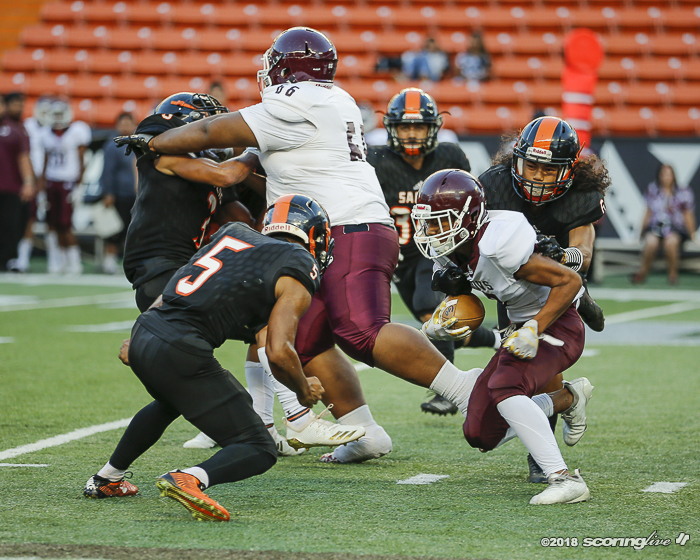 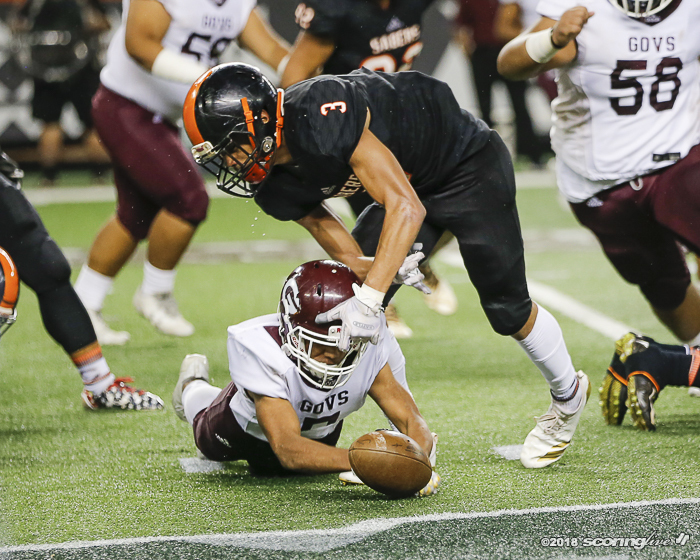 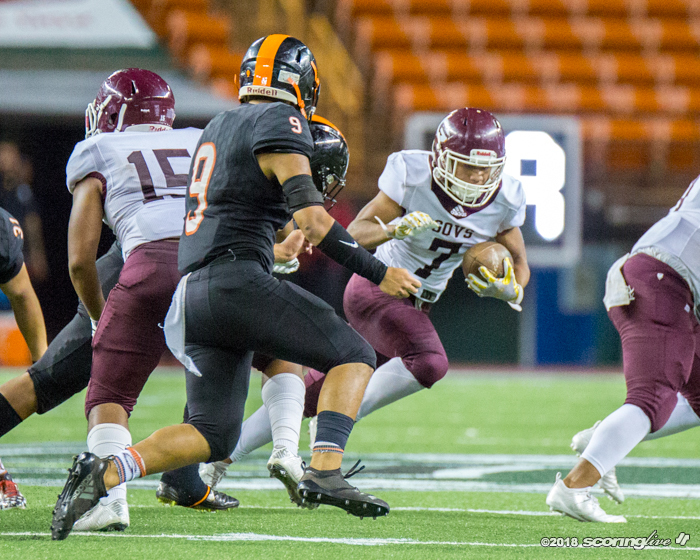 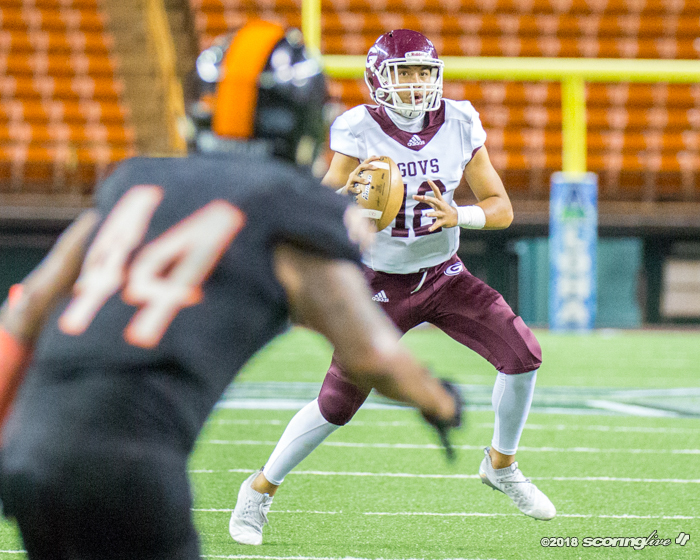 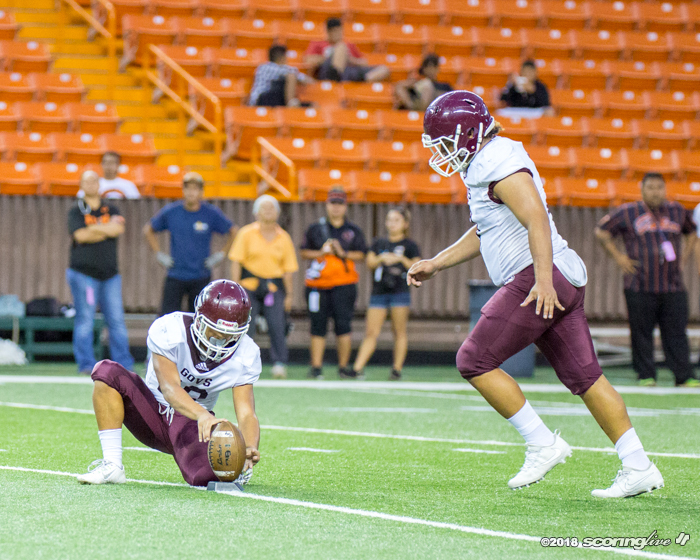 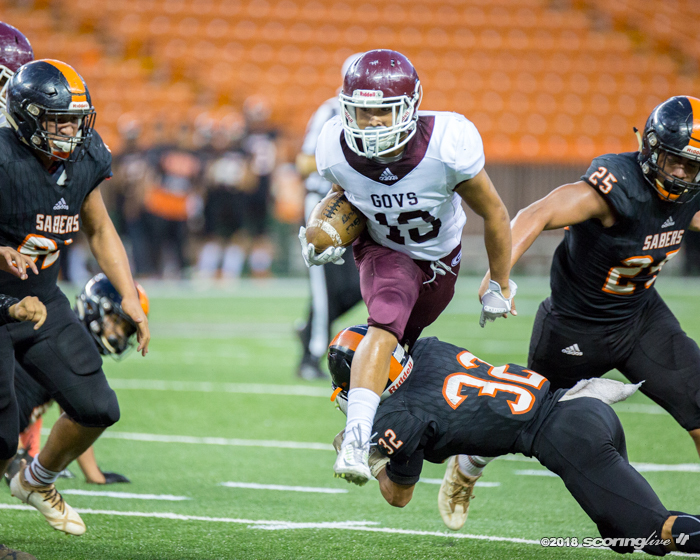 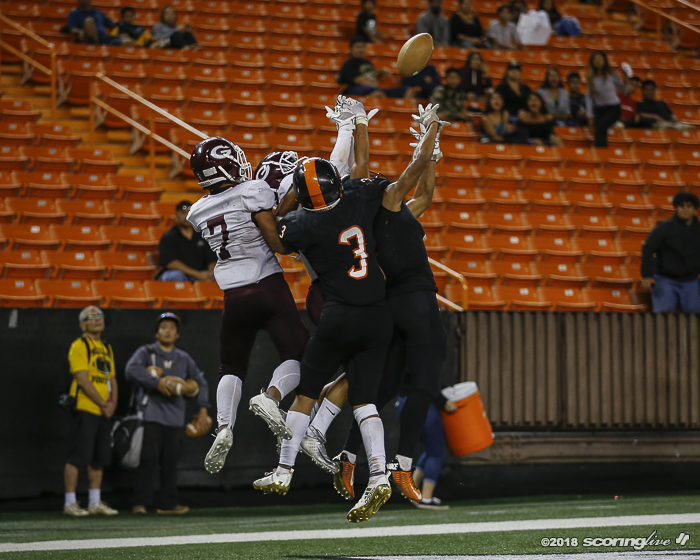 Farrington got as close as it would get when an 11-play, 60-yard drive saw the Governors convert two third downs and scored on fourth down on Raymond Millare's 1-yard run. 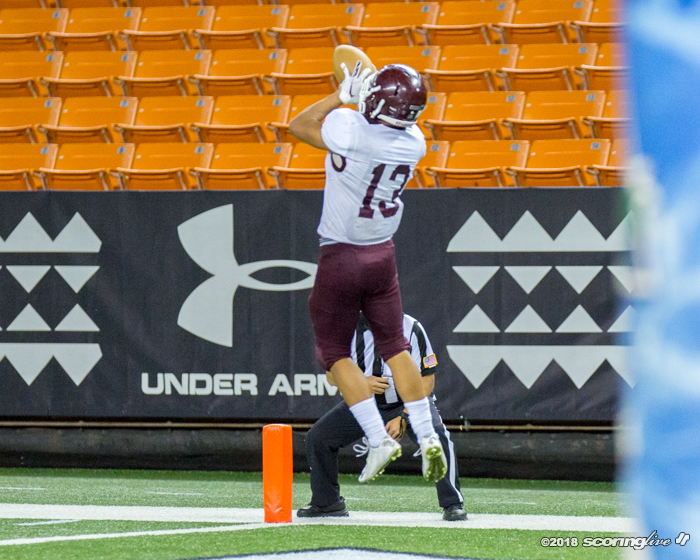 Farrington missed the PAT to keep it 14-6 with 7:34 in the half. 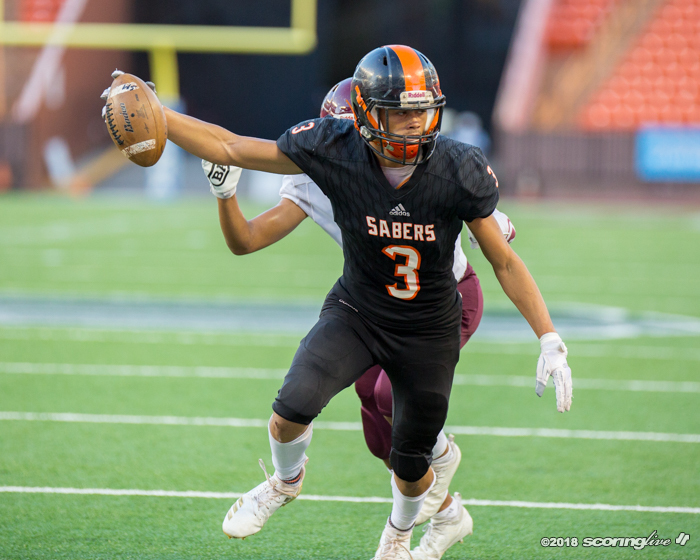 But the Sabers responded with three unanswered TDs before the half. 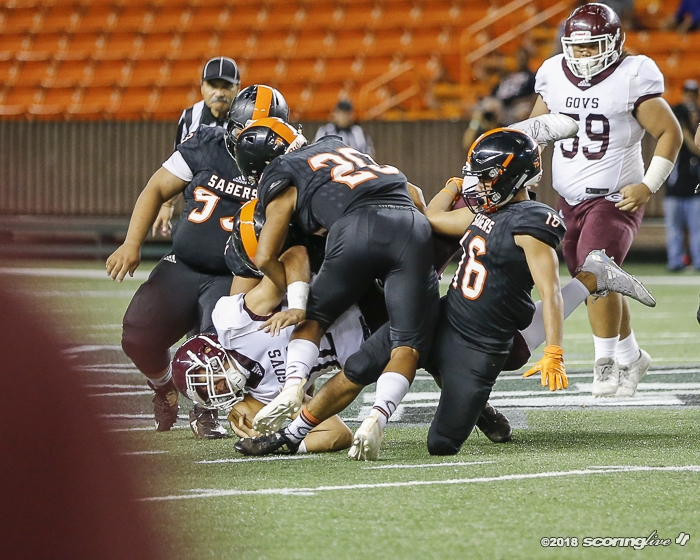 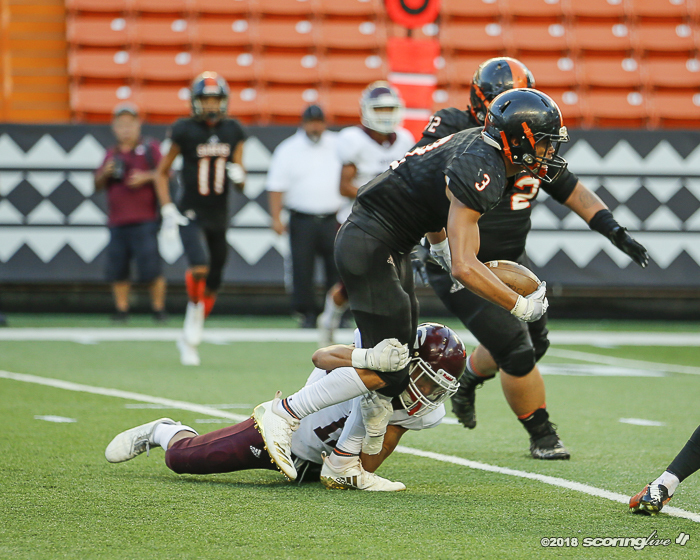 Lactaoen scored on a 7-yard run, Hipa hit Mokiao-Atimalala on a 76-yard scoring strike on first down before connecting with Adkins-Kupukaa on a 16-yard TD pass to make it 35-6. 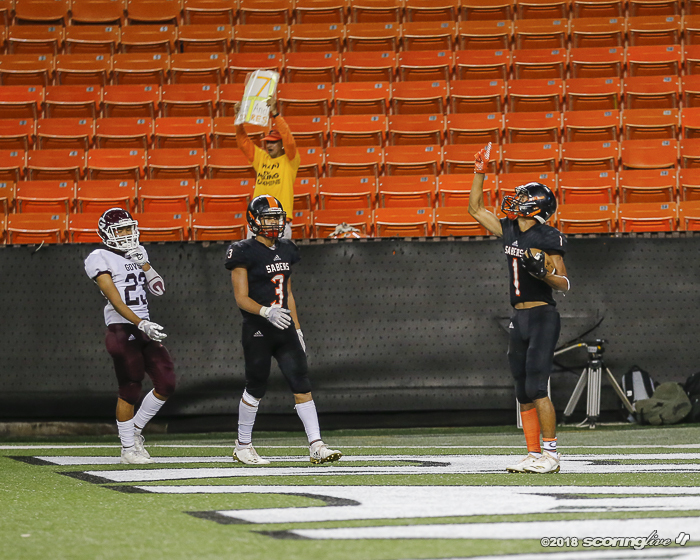 The last TD came after Campbell recovered a Farrington fumble. 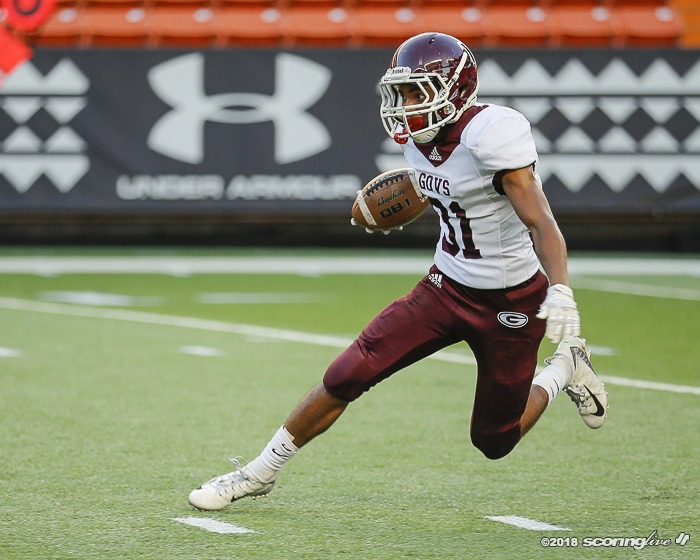 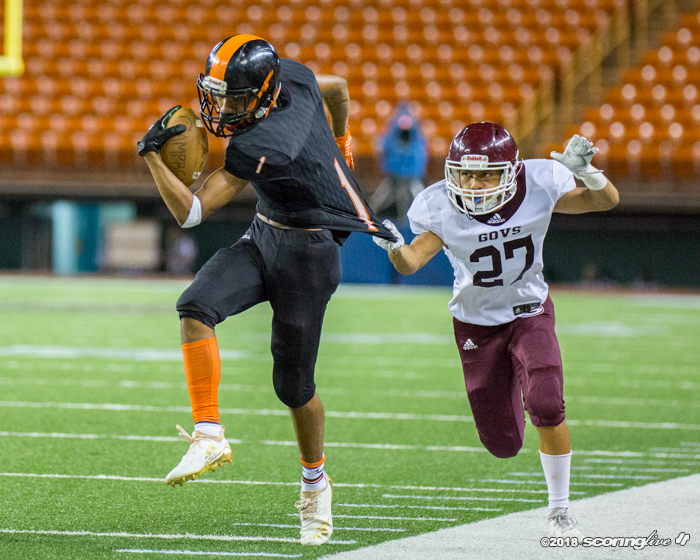 Farrington received the second-half kickoff and drove 61 yards on 16 plays with Selau Kalani scoring on a 1-yard run. 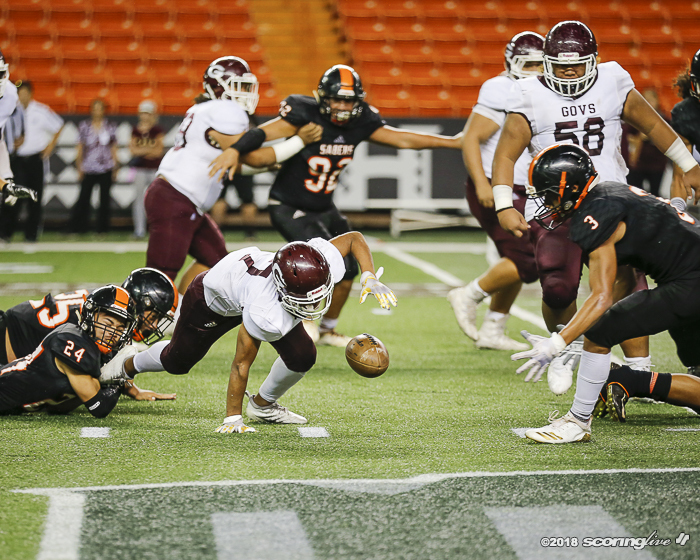 The 2-point conversion failed to keep the score 35-12. 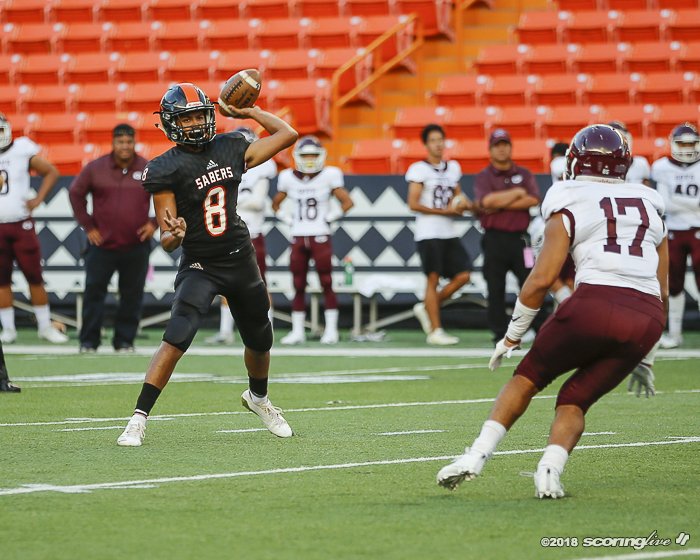 Meanwhile, Kaniala Kalaola started the second half at QB for Campbell. 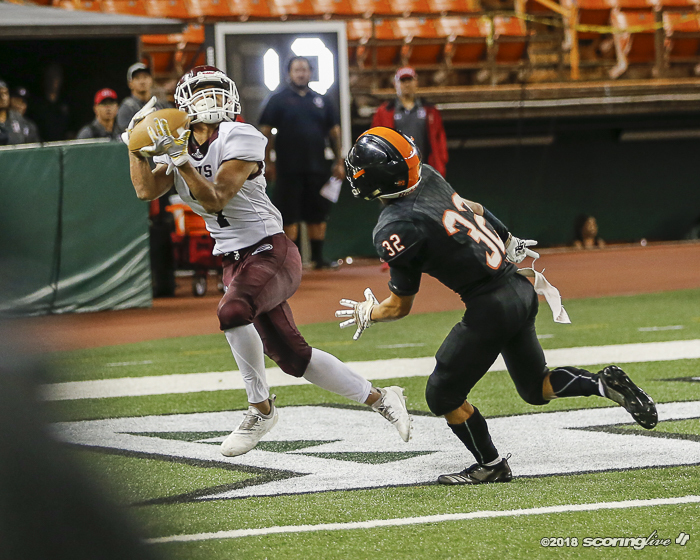 But a fourth-quarter interception by Wendell Alob set up Millare's 29-yard TD catch from Rjay Tagataese, who then threw a 2-point conversion pass to Kino Shoaf to pull Farrington to 35-20 with 6:43 left in the game. 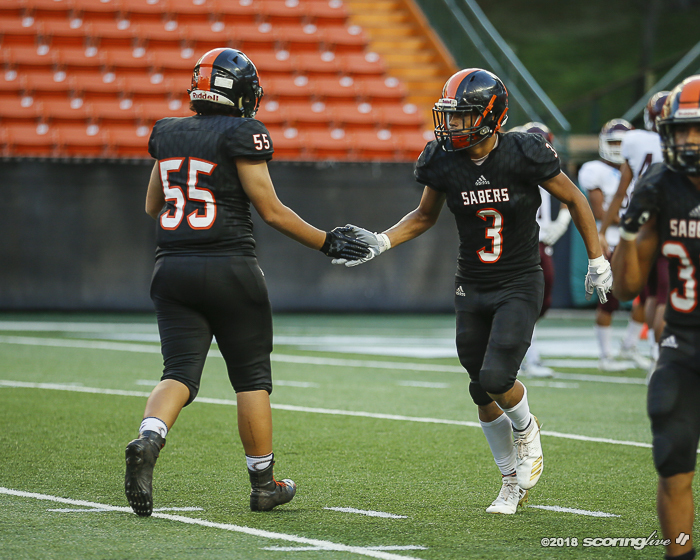 Hipa returned to the game and engineered a nine-play, 52-yard drive that ended with an 11-yard TD pass to Mokiao-Atimalala with 3:04 left to make it 42-20. 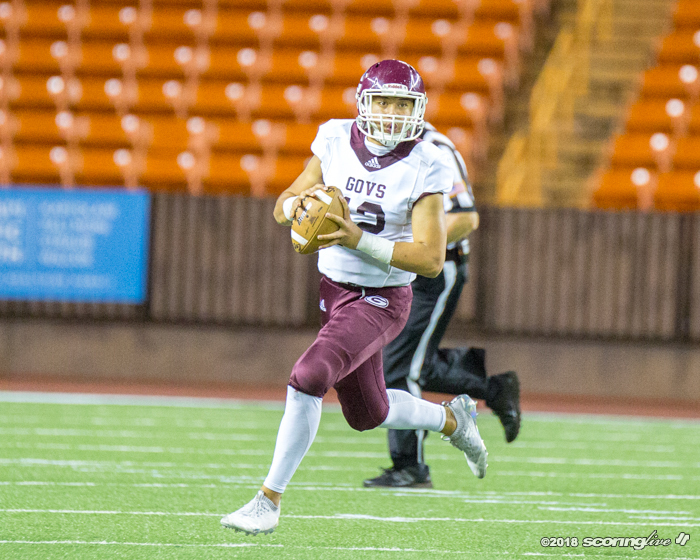 Farrington scored on Tagataese's 40-yard TD pass to Kalani to make it 42-26. 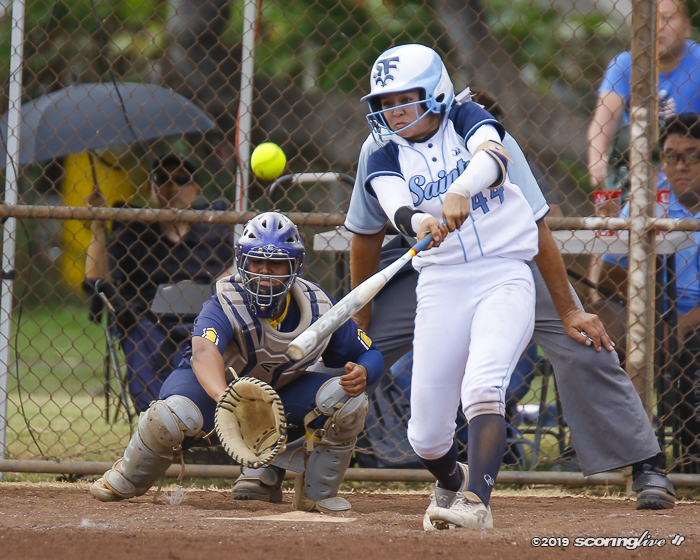 "Lot of motivation," Chanel said. 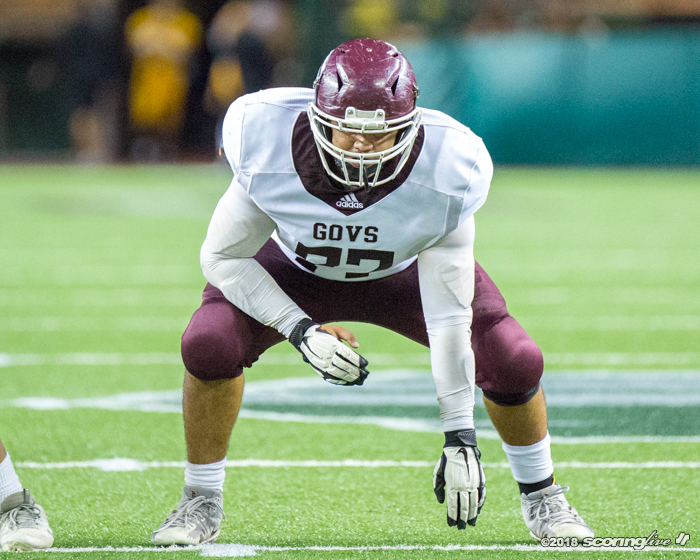 "We had a lot of good guys return tonight, but the penalties hurt us tonight. 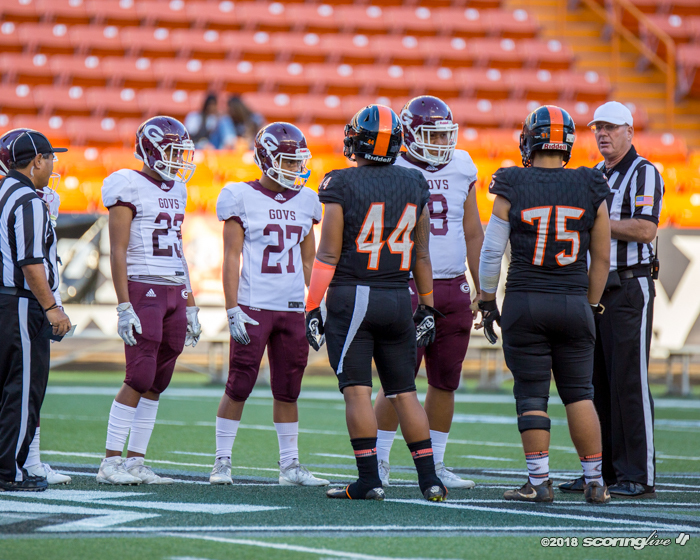 If we can fix that up, tune up on little things, we'll be all right." 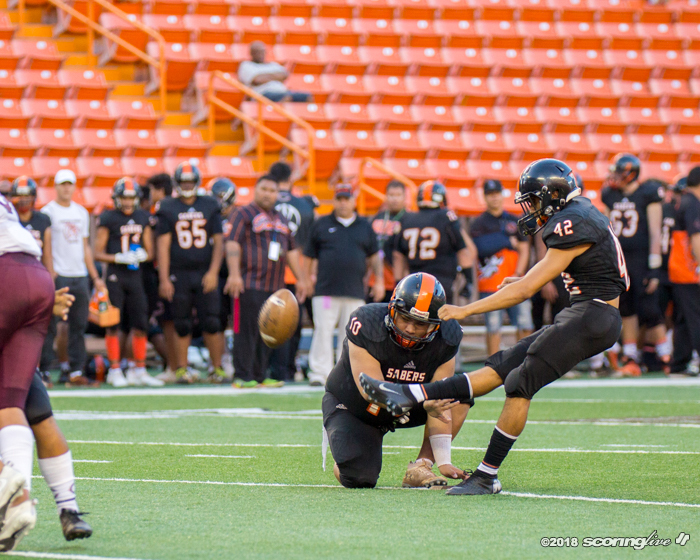 Campbell had 14 penalties totaling 121 yards.